Previously on the other post I made I explained that Life after Death indeed exist and has been proved time and time again through various experiments and experiences of people. It may or may not be a wonderful experience depending on your own qualities and your spiritual progress! To understand the Life in the spirit world, we must start from the basic question, who are we? All the humans, animals, plants, etc are infact souls (as said in the bible) and our bodies are more like a shell that our soul can "sit" in and gather enormous amount of experience required to progress further. God indeed exists but on a different scale than our conceptual theory. We have been created as souls and we shall live forever since our soul is immortal and filled with massive energy that can be replenished by doing good and selfess deeds. Each soul is a tiny amount of energy taken out from God! Imagine an ocean, you take a small drop out of it, and you put it back, the ocean remains there, it remain unaffected. Whatever amount of water you want to take out from it, the ocean will remain! But on the other hand, the water that you have taken out from the ocean cannot be called as "ocean" itself! Its state and condition has changed. This is the same principle that applies in case of higher realities, where each soul is like a tiny drop of water being taken out from a massive ocean, in this case the ocean the God, which is infinite! Now you have to remember, when a drop of water is taken out from the ocean the qualities, the content of ocean remains, but in a smaller amount. Compare it to a real soul, the qualities of God exists in each and every soul, may be it be an animal or even a tiny virus! As a soul is created, it has been given an objective to progress and reach the highest level of experience that he can get, just like in Role playing games that we play today on computers! A newly formed soul has to go through incarnations of all the species of animals, gather exprience of each being and live it! As you progress through this, you reach finally the human incarnation which is the most evolved experience a soul can get. Therefore, humans have free will, so that they can change their life pattern and choose between right and wrong, while all other animals, birds, bacteria MUST live in a strict life pattern whose characteristics are pre-defined! Today i am going to talk about what life in the spirit world actually is like and the 7 Realms that each of us will arrive there sooner or later, infact it is our real home! We have spent more time in the other dimension than we have spent our time on earth. The life in the spirit world can vary from person to person. Nothing works in a fixed pattern, you are responsible for what life you will lead in this world as well as in the spirit world! 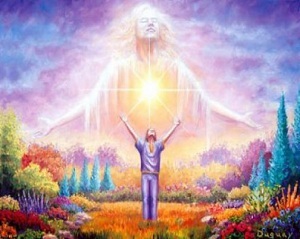 Thus, the life in spirit world is a vivid experience for each individual! There are 7 Realms in the spirit world starting from 1st and going up to 7th. Each Realm has 7 stages of progression. Basically speaking, no one, and i really mean no one has control over what realm they want to arrive. Everything is systematically constructed by God and each and every one of us shall arrive on the specific realm based on our karma. If, for example you have murdered "intentionally" any being -be it a flower, be it an animal, be it one of your kind- especially mass killing, and not for the reason to survive only, you will undoubtably go to Realm 1. Souls in the Realms of the Spirit World can visit higher realms or lower realms except of course Realm 1 - Realm 4 (included), meaning these 4 Realms can see only what is below them and not higher as the higher Realms are invisible. From Realm 5 and onwards souls can visit higher realms than them but not higher than 1. Someone from a higher Realm should invite them. They need to undergo certain training. They need to wear protective cloaks for the bright light won't blind them nor suffocate them. The cloaks also make the souls from the lower realms a little bit more light than they used to be. But these cases are not so often happening, and the ammount of time staying in that higher realm is significantly low. Also like i mentioned you can only "leap" from Realm 5 to 6 and from 6 to 7. The souls from higher Realms also need a protective cloak if they want to travel to lower Realms to guide other souls in order to improve. In this case, the protective cloaks are used so they can become invisible to the souls from lower realms and their negative light won't affect the souls from the higher realms. Those souls on Realms 1, 2 and 3 can never leave their realms except when they have repented (genuinely) and the souls from higher realms are sure the souls from lower realms are not lying. If they repent (genuinely) they are being given another chance to prove they won't do the same sins or they can even progress. This can take sometimes only 100 years or 1000 years depending on the soul. There are some souls that progressed in less than 100 years and got into Realm 6 from Realm 1 so it's not hard. The coming articles will explain much in detail about the pattern of life that we must lead in order to attain a better life and a better after life! Some of the articles shall provide extensive amount of research papers and evidence attached along with it! Life in the spirit world is an extensive topic to research and study on and I have decided to write as many detailed articles I can for you readers.